During his tenure as host of “The Daily Show” from January 1999 to August 2015, Jon Stewart skewered the news media and plenty of politicians — but he’s always had a soft spot for dogs, especially Pit Bulls. Here are just five of the many reasons why Jon Stewart is a doggone awesome guy. Even the theme song of “The Daily Show” has a canine-related title: it’s “Dog on Fire,” performed by They Might Be Giants. The instrumental tune was written by Bob Mould of Hüsker Dü. Based on the sound effects in the original version, its rather disturbing title might refer to a bowler who’s scoring a lot of strikes. 5. ‘The Daily Show’ office is dog friendly. “On any given day, a half dozen dogs roam the halls, scavenge for treats and bark when people start clapping at ‘The Daily Show with Jon Stewart,'” according to The Daily Show Dogs, a Facebook page dedicated to these lucky pets. 4. 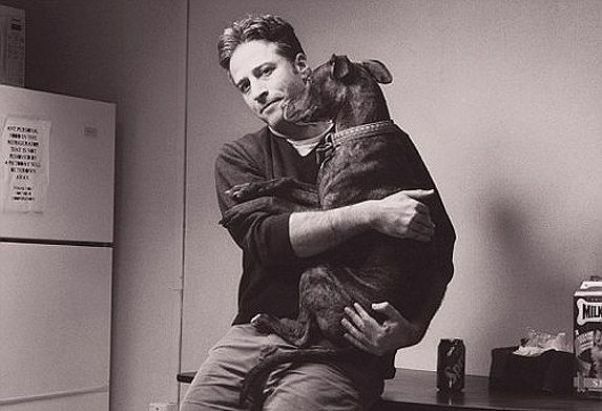 Jon Stewart is a longtime Pit Bull advocate. 3. He enlightened his audience about puppy mills. The “Big Red Dogs” segment, in which Olivia Munn interviewed a supporter of puppy mills, aired after Missouri’s Puppy Mill Cruelty Prevention Act passed in November 2010. “They’re expecting breeders to sit there and pay for an exorbitance amount of care that is not needed, like adequate food, adequate water, adequate space,” says Anita Andrews, director of Alliance for Truth, an organization that opposed the law. The segment gets even funnier/scarier after that, with appearances by “Dog Whisperer” Cesar Millan and spcaLA President Madeline Bernstein. 2. He ripped Michael Vick a new one. When it was discovered in 2007 that the NFL’s Michael Vick ran a dog-fighting operation and had killed several dogs himself, like most of us, Stewart was livid. “I’d like to cover him in liver and let the dogs see if he’s as fast and elusive as they say he is,” Stewart said, fuming, as the studio audience cheered. 1. He’s the dog dad of rescued Pit Bulls, including three-legged Little Dipper. Stewart doesn’t just advocate on behalf of Pit Bulls — he provides them with a loving forever home. Stewart, his wife Tracey (who’s a former veterinary technician) and their family have three: Monkey, Shamsky (named after baseball legend Art Shamsky) and three-legged Little Dipper. In a series of ridiculously sweet photos posted on Buzzfeed in May 2013, Stewart could be seen walking Little Dipper with a bright green leash along a New York City street.